My wife and I are reviewing a book by Susan Meissner. It is a different type of book for me. Usually I read Dekker, Peretti, Andrew Olsen, you know, guys. This one is a stretch but I’m looking forward to it. Summary: Women of all ages will appreciate this highly-readable, layered, and fast-paced story about self-discovery at all stages of life. With rich undertones of intrigue and romance, this contemporary novel with a historical twist explores personal blinders and how upbringing and conditioning can shape people to judge others in ways that can lead to unhappy consequences. Lauren Durough is a college student who finds herself on the road to self-discovery as she is hired by octogenarian Abigail Boyles to transcribe the journals of Mercy Hayworth, a seventeenth-century victim of the Massachusetts witch trials. Almost immediately, Lauren finds herself drawn to this girl who lived and died four centuries ago. The strength of her affinity with Mercy forces Lauren to take a startling new look at her own life, including her relationships with Abigail, her college roommate, and a young man named Raul. But on the way to the truth, will Lauren find herself playing the helpless defendant or the misguided judge? Can she break free from her own perceptions and see who she really is? Readers will identify with Lauren’s struggle to break away from society’s expectations and her attempt to strike out on her own while figuring out what parts of her own story to hold on to. Author Bio: From early school-day projects to becoming editor of a local newspaper in Minnesota, Susan Meissner’s love for writing has been apparent her entire life. 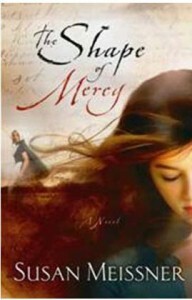 The Shape of Mercy is her latest novel in a string of books that delve into the deeper issues of life. She is the author of nine novels and lives with her family in San Diego. Find out more about her at www.susanmeissner.com. This entry was posted in society in general. Bookmark the permalink.